The Lausanne Movement and BAM Global organized a Global Consultation on The Role of Wealth Creation for Holistic Transformation, in Chiang Mai, Thailand, in March 2017. About 30 people from 20 nations participated, primarily from the business world, and also from church, missions and academia. During the Consultation process 2016 – 2017 we discussed various aspects of wealth creation, including justice, poverty, Biblical foundation, wealth creators, stewardship of creation and the role of the church. The findings will be published in seven papers (Aug – Dec 2017) and in a book (2019), as well as through an educational video (Feb 2018). The Wealth Creation Manifesto conveys the essentials of our deliberations before and during the Consultation. It is available in 14 languages so far. It has 13 short ​episodes, and is based on the Wealth Creation Manifesto. Fantastic! It is wonderful to see the progress being made fast. I have had a fabulous two-day conference in Phnom Penh with a blessed moment of experiencing Jehovah Jireh. Praise the Lord! I started using and sharing the Wealth Manifesto as soon as I became aware of it earlier this year. I’ve followed your work since the BAM track at Urbana ’09 (when I was director of InterVarsity in Florida) and appreciated your talks at last week’s BAM conference in Dallas (where I taught a breakout session and hosted an exhibit). If I sent you a PDF copy of our level two business training curriculum, would you let me know of possible contexts for its use? While there are many level ones (how to start a business) in use, we (successful American entrepreneurs with six years of experience mentoring/training entrepreneurs in the developing world) wrote GrowBook to help existing entrepreneurs take their businesses to the next level. It is currently in five languages with several more in process (see Amazon link below). While the Dallas conference was focused on involving North Americans in BAM, I understand there’s a lot going on to empower indigenous entrepreneurs; how can I learn who’s doing what in that space? Imagine the quadruple bottom line that can be advanced as millions of developing world entrepreneurs grow companies, create jobs, and help their communities thrive! Thanks Mats. Hi Evan and sorry for late reply. Still trying to catch up on email after an intense travel and speaking period. The 2nd half of September was very full in terms of travel and speaking at various BAM conferences: Sthlm – Copenhagen – DC – Dallas – Abilene – Dallas – Houston – Sao Paolo – Vitoria – Sao Paolo – Newark – Atlanta – Birmingham – DC – Copenhagen – Sthlm. I’ve done two 24+ hrs trips over night in a week. Phew, still alive and well, and the meetings have been very good. Thanks for your comment and background info! 1) “Wealth hoarding” under point 5 is translated as “wealth accumulation”, the Russian word used (накопление) does not have the same negative connotation as “hoarding” in English and can simply mean “saving up” without specifying how the accumulated wealth could be used. Whereas “hoarding” has a clear message of saving up for oneself, selfishly and purposefully with no desire to share. I would suggest changing that word in the Russian translation to “накопительство”, it would be much closer to the original. 2) Under point 6, “material simplicity” is translated as “moderate/humble consumption”, which does not correspond exactly, but does work. However, right after it, in parentheses, there is a clarification of what this modest consumption means: “voluntary poverty.” I understand that the translator could have added this because they wanted to emphasize the contrast between the involuntary poverty in the next sentence and the call to material simplicity, but I do not find this addition helpful. “Voluntary poverty” is not the same as “material simplicity”, and for Russian speakers (who usually come from the post-soviet context and who got to see their parents in, and oftentimes experience, all kinds of “poverties” if you know what I mean), this is not the best word choice. Plus, there’s no such parenthetical clarification in the English original. Of course, these are just suggestions. Thanks! 1. What methods or means or to put it in other words what model of economics are we talking about? If it is the ‘Capitalist’ model then I am afraid you are way off from the biblical or the trinitarian model. One questions that comes to mind is, how can anyone who believes in the God of the Bible and His incarnation follow a model which is basically about investments being commensurate with returns? And one cannot turn a blind eye to all that happened in the name of capitalism – extortions, oppression, enslavement etc. – despite the fact that it has brought development to many parts of the world. Even on the question of development – who defines development? 2. Statements like, “The great omission has been the role of wealth creation—through business—for the holistic transformation of people and societies, to the greater glory of God. This was the focus of our consultation and its resultant manifesto.” And “Wealth creation is a godly gift and command, and business is a “noble calling,” as Luther and Calvin put it, a “noble vocation,” in the words of Pope Francis. Business and wealth creation can and should be solutions to justice issues such as human trafficking and environmental challenges.” make the assumption that wealth or money is essential for doing God’s work. This is a sentiment which neither our Lord nor any of the 12 apostles would support. And how is the word ‘business’ defined? We undercut our own authority when we think that Christ and money are necessary for missions. Unless we come up with simpler and smaller ways of doing God’s work, we would be unwitting instruments in the hands of the enemy of our God. Incarnation teaches that small and simple is the way and not the big and great. If this is not understood then we are on sticky ground, whosoever we might be! The incarnational model is about small, simple, personal, immediate and direct ways of reaching out to need. Such a model puts onus on the individual Christian to reach out in personal, direct and immediate ways. The national, the regional and the global require big projects, big budgets and big everything. Such approaches might be very impressive but are necessarily indirect, impersonal, mechanical, distant and officious. Such thinking is not from Bethlehem but from Babel. And these methods evoke memories of imperialism and colonialism for many in the South. The statements quoted above betray global thinking but must we meet global needs with global projects? Should we not be teaching and equipping the local church to reach out to need in their own neighbourhoods in palpably local and simple ways rather than on models defined through the grid of Westernism? 3. I wonder if the Lausanne Movement should be part of this! Definitely not if it is in the mould of capitalism. The most insidious of things ever to happen to the church in the last 2000 years is the capitulation of the church with capitalism! This is her patent worldliness. Unless the church by careful analysis and understanding extricates itself from the influences of capitalism, modernism and all other ‘isms’ which arose as a result of it… she can never rise to the challenge of her calling as Christ’s body or bride. 4. The way the world has gone in the wake of industrialisation, capitalism, modernisation etc is not the way the follower of Christ needs to go. The manifesto on Wealth Creation seems to give tacit acceptance and approval to most of what those processes represent historically, by talking about needs of justice, human trafficking and looking for wealth creation as a way of redressing those issues. Such thinking does not arise from a trinitarian understanding of God nor His incarnation in Christ. 4. Wealth Creation with local and simple models to meet local needs is the way forward and not the profit-making or environment unfriendly ways of large projects. Practically every project and every ‘business’ leaves an end product of some damage, loss and grief. In simple and local models the damage, loss and grief are minimised. We must remember that while the vision of Christian missions is global but the means, methods, strategies etc must necessarily be local. Otherwise we would cause great damage to the cause of Christ for a few centuries longer…. You, Enoch, have questioned whether the Wealth Creation Consultation’s support for wealth creation also implied or carried over into a support for the economic system called “capitalism.” Although our consultation deliberately avoided this issue, I can say a few words in response. Two caveats: First, I hasten to add I only respond as one member of the consultation’s convening team—though I suspect our chairman Mats will have some broad sympathies with my approach (and I will copy him on my response). Secondly our consultation does not necessarily represent “the” voice of the Lausanne Movement; we are simply one voice in a movement of various views on economic matters. We are here simply trying to move the conversation forward. “Can it perhaps be said that, after the failure of Communism, capitalism is the victorious social system, and that capitalism should be the goal of the countries now making efforts to rebuild their economy and society? Is this the model which ought to be proposed to the countries of the Third World which are searching for the path to true economic and civil progress? The answer is obviously complex. If by “capitalism” is meant an economic system which recognizes the fundamental and positive role of business, the market, private property and the resulting responsibility for the means of production, as well as free human creativity in the economic sector, then the answer is certainly in the affirmative, even though it would perhaps be more appropriate to speak of a “business economy”, “market economy” or simply “free economy”. The pope here raised two issues: the pragmatic (the economic failure of capitalism’s opposite system: communism) and the principled. Though the pope majored on the principled, I will start with the pragmatic. The first thing one looks at is the simple practical question of “what actually helps people, not in theory but in practice?” What helps combat poverty, then? Is it “capitalism” (which I take to be essentially the free market system in which people have individual property rights and the freedom to engage in business or its opposite? One need only look at the USSR in our recent past or Venezuela and Cuba today to see the answer: the economic failure of anti-capitalist systems. By contrast, we see, post-WWII, the rise of the Asian Tigers out of poverty through enterprise (and the free market system that encourages it) and more recently both China and India seeing 100s of millions come out of poverty. These are facts that cannot be wished away; poverty alleviation through enterprise has been both real and significant. No-one, of course, argues that these free enterprise systems are without problems, but then one does not expect any earthly system to be perfect. Imperfection doesn’t disqualify a system; it simply means more work needs to be done. You pertinently ask “who defines what is ‘development’?”, which is another way of asking “who defines what ‘works’?” I say “the people,” those who “vote with their feet”—these are the one who define what works. Just notice where the stream of “economic refugees” flow; this is people voting with their feet: It is toward free market North America and free market Europe (the social democracies of Europe are still “capitalist” in emphasizing private property and private market activity). Clearly these economic refugees like the economic prosperity and stability they see there. These economic refugees prefer these places because they recognize a system which makes available to common people benefits that in times past used to be available only to the richest and politically powerful: transportation, holidays, foreign holidays (in Europe not remotely unusual), clothes, drudgery-alleviating machines, computers, health care (admittedly patchy), etc., etc. Now, should we insult these who vote with their feet by saying they don’t really know what is good for them? that we know better than they? I think not. Those of us in Christianity who argue for capitalism would not argue for it on the basis of Wall Street, the movie’s, basis that “Greed is good.” That is a modern argument that, leaning only on the technical side, has forgotten the moral considerations that were at the very heart of early 18th century arguments for capitalism. Increasing the tax base is an important part of exiting structural poverty. Failure to do so will keep nations in poverty. The only way to enlarge the tax base is through enterprise creating jobs and increasing corporate and employee tax revenues [through SMEs]. Sadly, aid, philanthropy and even micro-finance, however well intentioned, do not enlarge the tax base but actually propagate the informal sector. We too believe in the “small and simple” that you advocate, but we do not idolize it. God’s creation has variety: both the small and simple as well as the large and complex. Jesus alternated between focusing on his intimate circle of 12 and then interacted with the large crowds. In the book of Revelation, the resurrected Christ similarly addresses people both individually (Rev. 3:20; 20:13) but equally as part of a vast “multitude” (Rev. 7:9) or inhabitants of a huge mega-“city” (Rev. 21). We need to have room for both the small and local as well as for the large and universal. Once again, thank you for your concern and taking the time to write. Thanks Enoch for your thought provoking comment! 2. What really helps the poor? Theories can be helpful at times, but lofty ‘isms’ are not the answer. At the end of the day a foundational question is what is really lifting people and nations out of poverty. To this I would say two things: first, the issue is not which ends of the telescope we use but how we focus the same telescope; second, I think your view of the kingdom is not so much wrong as incomplete, elevating one part of Scripture over another such that much scriptural truth is suppressed. Let me explain. First, I do not think the issue is so much that we are looking through different ends of the telescope, with you taking God’s perspective and us taking the lower road oriented around man’s need. I think we are both actually looking through the same ends of the telescope, simply focusing it differently. That is, we interpret Scripture differently than you do. Can we not agree, then, to honor each as seeking God’s perspective, despite our differences? You insist that in God’s agape Kingdom there “is no trade or business” because God acts “without expecting returns in terms of profits or compensations.” This is not accurate. 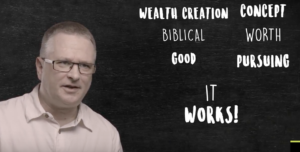 Money is only one sort of return—no more inherently “dirty” than the return of any other created thing in God’s world (it’s the “love of money,” not money itself which is the source of all sorts of evil)—and, in fact, God expects very high returns. His love-demands are large. In the past he demanded—and still demands today—love and obedience from Adam and Eve. He created them and he wanted something in return. He “freely gave” life and existence to them only in the sense that it was a gift not earned; but it was not freely given in the sense of not expecting something back. You are right that agape love often demands the sacrificial “you win/I lose” sort of love you call for. But this is not the whole story. This heroic sort of love also needs the more pedestrian everyday sort of the “I win/you win” mode. Forced martyrdom is not required. This is precisely what the apostle Paul taught the Philippians, writing, “Let each of you look not only to his own interests, but also to the interests of others.” (Phil. 3:4) He assumed here that considering one’s own interests was fully legitimate. He simply also insisted that the focus not remain here. Selfishness (which is sinful) must not be confused with self-love. The latter is actually expected and validated by Scripture. For instance, Jesus taught that, “You shall love your neighbor as yourself.” (Mt. 22:39) If we were to have no love for ourselves then, applying this scripture, we should have no love for our neighbors! “A generous person will prosper; whoever refreshes others will be refreshed. Normally generosity is seen as giving away from free. What is striking about this verse is that even the act of selling can be viewed as generosity: making things available to people (here is the win for others) even at a price (the win for the seller) is praiseworthy. Eph. 4:8 establishes “getting paid” as a biblical principle while II Thes. 3 establishes “paying” as a biblical principle. It is not all “freely giving” and freely getting. He wants these Ephesians and Thessalonians to pay their own way, earn their own keep, even to the extent of laying down the apparently harsh rule of “If anyone is not willing to work, let him not eat.” (v. 10) Here, agape looks quite different from how you have laid it out. I fully agree with you that the 12 apostles should be freely giving their services. No-one should charge money for prayer, or healing, etc. But these church redemption roles are not the entirety of the body of Christ’s function. The five-fold ministry (apostles, prophets, evangelists, teachers, pastors, Eph. 4:11) are there “for the equipping of the saints for the works of service” (Eph. 4:12)—saints who are not in these churchly roles but out serving in the community as business people, government employees, laborers where paying and being paid is the rule. The power of this model is evident from Acts 11 where it was these ordinary, laboring believers who—scattered by persecution—were the first to penetrate with the gospel into neighboring Gentile lands (Acts 11:19-21). Enoch, I fear your model focusing only on the freely give/freely receive principle of the five-fold ministry, invalidates the calling and vocation of so many who operate in the created world of buying and selling—a world that ought equally be recognized as under God’s lordship. It would return us to the bad old days of the sacred/secular divide. That is not the way we ought to go. Gentlemen – Paul and Mats, I am not at all interested in entering into a verbal duel online or bandy words with you and prolong this. I wish to state that I am in no way questioning your sincere commitment to Christ and His word nor doubting your intellectual and biblical integrity. If I understand you correctly and I believe I do… the basic difference in what we are saying is that both of you and I are looking at the issue on hand from two different ends of the telescope, as they say. You are looking from the need-end of the issue and when you do that it so easy to see that what you are proposing in your papers is the right way forward and you will find a lot of scriptural support too. Besides you have so many facts and figures to throw at anyone who counters what you say because you do have a lot of facts and figures to quote to justify or support your position. And you would also find a lot of authorities to quote from. But when you look at the issue from God-end and seek solutions from his perspective as revealed in His word, then it opens to a totally different approach to need. I sincerely appeal to you and to anyone concerned for poverty, justice, human-trafficking or any other need for that matter – to contemplate on Trinity and His incarnation in Christ or even from the Kingdom perspective as taught by Christ in the gospels. I have read the Biblical basis given in your paper, I do not agree that they give sufficient basis for what you wish to do. Of course this is only a humble plea for, what seems valid and good today, down the line it could take us way off-track from what Christ and His apostles taught. Let me explain briefly – how does knowing God as Triune and knowing Him in His incarnation bear upon the issue on hand. The trinitarian approach or the incarnational approach is the AGAPE approach. The relationships in the Trinity are based on AGAPE and the dynamic by which they fellowship with each other or share their life is the dynamic of AGAPE. AGAPE, the divine love is about loving, giving, serving without expecting returns in terms of profits or compensations. There is no trade or business in this. There are no margins or profits. It is pure self-giving love. This is the way God loves in His own being, this is the way He loves us and therefore ‘gave away His Son for us’. This is what the twelve apostles did. They just went and gave away of themselves to others. They did not make wealth nor teach others to make wealth. They rather imparted Christ and the fullness of God in Him, which is now available in His body the church. “Freely you have received, freely give.” is the God’s way. One might argue that unless one is rich one cannot give. But the riches that are spoken of here are not the material riches that we seem to think. I believe it is the fullness we enjoy in our fellowship with God through Christ. So this would sometimes mean that like the Macedonians in 2 Corinthians 8 who, “In the midst of a very severe trial, their overflowing joy and their extreme poverty welled up in rich generosity.” towards the believers in Jerusalem. Friends, you may work through trade and business to address issues of poverty, justice and any other problems but to say that it has biblical sanction would be to miss the point of the Incarnation of the Son of God totally. It would also amount to an unfair and convenient usage of scripture of the ‘end justifies the means’ kind! Sorry if that sounds harsh! Thank you for taking the time to read and reply to my comments and objections. It is very evident that we do not agree in our understanding of trade and business, especially in the context of Wealth Creation. What I do not understand is why would you want to give it biblical sanction? You wish to engage in Trade and Business, by all means you have the freedom. And if you wish to help the lot of those living in areas of poverty, injustice and human trafficking by all means you have the freedom to do it. There are so many in the world, who are not followers of Christ nor Christian in any sense of the term engaged in doing it. This is commendable and part of the image of God in us. But does one need to give it biblical or Christian under-girding? Much of the teaching including the scriptures Paul quoted in his last response to me indicate very clearly that we differ in our understanding of scripture whether Trade and Business has biblical sanction. First much of the teaching on this, I believe, is based on what in hermeneutics is known as, eisegesis and there are gross extension fallacies in interpretation and reasoning. For instance all your quotations to support trade and business from Proverbs, Eph 4 and 2 Thessa were not meant in the context of trade of buying and selling. Proverbs and Apostle Paul are just talking to people in the context in which they were living and advising them how to behave. Those passages of scripture or most of the others that are generally quoted do not validate Trade and Business nor the economic model that most businesses espouse, including the so-called Christian businesses. Paul, in the last paragraph of your response to me you talk about, “…the calling and vocation of so many who operate in the created world of buying and selling…” You need to ask the question and consider why people began to buy and sell rather, and not presume that those activities have God’s tacit approval or that they were part of God’s creation. As I mentioned in my first mail, I am not against wealth creation. I am against how and why we engage in wealth creation. In the present context, I say wealth creation yes but not through trade and business. And my argument is that both these – trade and business as they are understood today – are not based on the agape model of living which we are all called to, in Christ. I think this is where our disagreement lies. We were all created in the image of God and we are called in Christ to belong to Him as His own people. The goal in creation and in our calling is to reflect the image of God in us. We need to understand Apostle Paul’s words in Ephesians 5:1, 2 in this light. So when he charges believers to ‘be imitators of God, as beloved children. And walk in love’, it is for every one called to be children of God. Was he just addressing the 12 apostles or those who play the ‘church redemption roles’ as you call them? I think not. It is for every one created and called to be God’s own people. So both by creation and calling we are all charged to live lifestyles of Agape, not just those charged with the ‘work of the church’. Does this sound as sacred-secular divide? So rather than invalidating ‘the calling and vocation of so many who operate in the created world’, it puts everyone on par – those who are in the five-fold ministry roles and all others. If we do not agree on this then we are certainly in serious disagreement. Since we work in the world we do accept the payment that the world offers. And we do use money for all our transactions in the world. But do we live for money or live as though our lives solely depended on money, wealth or the material? I affirm not. Why would Jesus pit money as a rival to God when he said, ‘You cannot serve God and Mammon (Greek mammon, a Semitic word for money or possessions)? Was he not aware that Mammon or money was the matter that he called good at creation, according to what you say? I believe ‘serve’ here, can also be interpreted as ‘worship’ or ‘live for’. So the question is not just about the ‘love of money’. It is about who do you serve – money or God? This is the reason why I say, that money or matter is incidental to and not essential for the Kingdom of God. If you think that this is not what the Lord or the scriptures mean, then certainly there is a very serious disagreement between us. Finally, I would sincerely request you to look again at the quotations from Eph 4 and 2 Thess 3, which you mentioned, Paul. Aren’t you making too many extensions of the corporate-world kind and attributing them to Apostle Paul? Does he really talk about payment in the way you seem to think? 2 Thess 3:12 states, “Now such persons we command and encourage in the Lord Jesus Christ to do their work quietly and to earn their own living.” The words ‘earn their own living’ is actually ‘to eat their own bread’. Eph 4:28, talks about working in order that one has something to share with others. How does it constitute trade and business? It is because of the way the economic models and patterns of the world, seeped into the church unquestioned and baptised as scriptural, today we have the sad spectacle of the church and its ministry being run as private entrepreneurship. And many have built their careers, churches and ministries around the power of money and management acumen learnt from the business world rather than on the power of the Kingdom of God. Thus we have lost our identity as God’s own people and in the bargain our witness compromised. Probably you wouldn’t agree with me on this either! I can see that you are sincerely convinced about Wealth Creation through Trade and Business as scripturally valid. I can also see why you think I am wrong in questioning. God alone must open our eyes to see if what we are saying is right or wrong. Each one of us is free to choose to live and work the way we think is right. We are also free to understand scriptures and apply it in ways that we think is right. But all of us are equally responsible for what we choose and do and that all of us are ultimately accountable to God. I hope you would agree with me on this, at least! How Greg Hanson of Port Angeles, WA affiliated with your organization? He is launching a business program under your credentials.